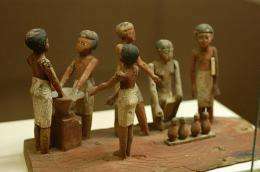 Egyptian wooden model of beer making in ancient Egypt, located at the Rosicrucian Egyptian Museum in San Jose, California. Photo: E. Michael Smith Chiefio, via Wikipedia. (PhysOrg.com) -- A scientist studying an ancient Celtic site believes he has worked out the recipe they used for making beer around the year 500 BC. Dr Hans-Peter Stika, an archaeobotanist from the University of Hohenheim in Stuttgart, Germany has been studying the remains of an early Iron Age Celtic settlement at Eberdingen-Hochdorf dating from around 500 BC, in particular the six oblong ditches dug for the process of making barley malt for beer. The excavated ditches contained thousands of grains of charred barley, which Dr Stika believes are the remains of the production of high quality barley malt needed for making beer. Dr Stika reproduced several methods for making beer that the Celtic peoples in the Iron Age might have used, and concluded that the ditches were used to soak barley grains until they sprouted. Fires were then lit at either end of the ditch to slowly dry the sprouted grains and give the malt produced a dark color and smoky flavor. The slow drying would have stimulated the growth of bacteria that caused the release of lactic acid, which added sourness to the end product. The excavations at Eberdingen-Hochdorf have also yielded seeds of henbane, a plant also called stinking nightshade and known to increase the intoxicating effect. Dr Stika thinks the beer probably also contained mugwort and/or carrot seeds, since these were known to have been added to beer in medieval times. The spices would have given the brew a much different flavor to the hop flavor known today. The use of hops is not known before 800 AD. Dr Stika thinks the fermentation was probably produced by yeast on the brewing equipment, or by wild yeast on honey or fruit added to the brew. The final beer would have remained cloudy and with a yeasty sediment, and the brew would have been drunk at room temperature. The findings are published in Archaeological and Anthropological Sciences, but the Celtic findings are not the oldest beer and beer-making discoveries, as brewing facilities dating to around 5,500 years ago have been found in the Middle East. I wonder if Dogfish Head will brew this as a seasonal. I hope so. They make another brew based off of pottery fragments found in Honduras dating back to about 1200 BC. Great stuff. If they did brew this, I would make a trip to Rehobeth Beach just to try it out. I'm not sure if I could manage more than one bottle, because the brew apparently was cloudy with a yeasty sediment and served at room temperature. I wonder how they were able to produce this beer without bacterial contamination, considering how crude the equipment was. the brew apparently was cloudy with a yeasty sediment and served at room temperature. Just how I like it. Mmmm. I'd love to go to an "ancient recipes" restaurant that attempted to put together meals and drinks from ancient sources. Some of the finest brews in the world are the result of whatever yeast falls into the vat whilst it is open to the night sky. Monks are particularly fond of this method. Have some french fries from George's Lunch while you're there. There are generally two ways to reduce the risk of bacterial contamination when you don't have sanitizing solutions like modern brewers do: high alcohol content or hops content. Hops are good at preserving beer and killing bacteria, and alcohol is also a good way to stop bacterial growth. Since they did not use hops, perhaps they used some other antiseptic root, plant, or seed that took their place. As for the sourness of the beer, that was likely caused by Brettanomyces, a wild yeast that's still used to brew many Belgian-style ales, as well as many wines. I could see Sam doing something like this, especially in their small batch brewery at the brew pub. Perhaps this will be a future experimental brew on 'Brewmasters'.